Roasted Tomato Paste - Get the Good Stuff! The hardest part of making roasted tomato paste is squishing the tomatoes, separating the pulp from the skin and seeds. I use the fruit strainer attachment to my KitchenAid stand mixer, but you can use a hand-crank version, as I did for years. If you process a lot of tomatoes - and I do - a motorized strainer is a blessing. When you wash the tomatoes, you’re not only getting dirt and debris off the outside, but checking each fruit for blemishes or moldy spots. Soft or split tomatoes are fine to use, but cut out any black or spoiled spots. Cut the tomatoes lengthwise in quarters, as they’ll fit through the strainer better. Follow the directions for your specific strainer. You’ll want the squeezings (the remains) to be as dry as possible – I tend to put them back through the strainer once or even twice, to extract the most pulp that I possibly can. At my house the seeds and skins go into the compost pile, though Joel MacCharles at wellpreserved.ca likes to dehydrate them and use the resulting tomato powder as a seasoning. When I can tomato paste, I do not use salt. Simply put the tomato pulp in a wide flat non-aluminum (nonreactive) roasting pan so that you can evaporate the liquid. I like these 2.5 inch deep hotel pans, which are easy to clean – the rounded corners help immensely. One of these pans will hold the pulp from 10 pounds of tomatoes – if you have more than that, use at least two pans. (NOTE: a half-bushel of tomatoes weighs about 25 pounds) Put the pan(s) in a hot oven at 425˚F and leave them to roast for up to 4 hours. Stir occasionally. When you can draw a spatula through the pulp and an empty streak is left behind, and is not filled in again, the tomato paste is ready. I find a wide flat pan an inch deep in tomato paste to be awkward to handle, so first, I scrape the hot pulp into a bowl or big measuring cup. Ladle the paste into prepared jars, leaving 1/2 inch headspace. I mostly use 4-oz jars, though according to the National Center for Home Food Preservation, you may use up to 8-oz (half pint) jars as shown in this photo. Add citric acid to each jar: 1/8 teaspoon for 4-oz jars, and 1/4 teaspoon for 8-oz jars. Place lids and bands on jars. Process in a boiling water bath for 45 minutes. The time is the same for both 4 and 8 ounce jars. Let cool, label, remove bands, and store in a cool dark place. I mentioned that I often need a little bit of tomato paste, so I freeze paste cubes. I like to use a flexible silicon ice cube tray, then remove the frozen cubes and bag them, so I have a handy supply. Maurita, your blog looks great! That’s so kind of you to say! I’m very pleased with the redesign, ESPECIALLY the indexed recipes. 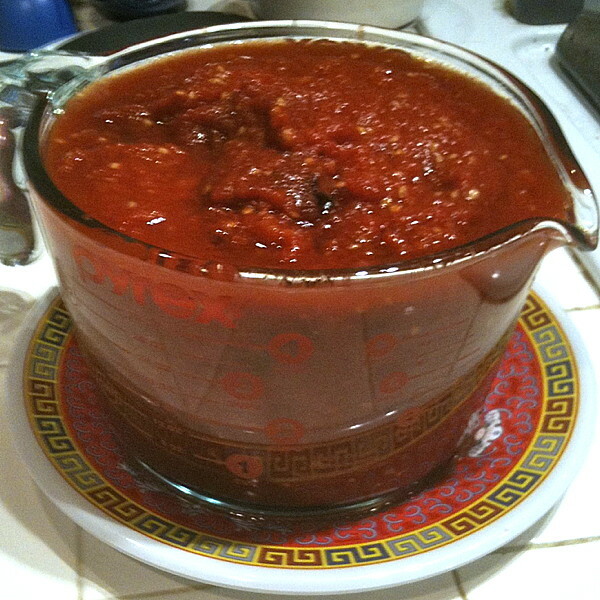 Slow Cooker Tomato Paste - Get the Good Stuff!